Does a roadrunner ever run on sidewalks? Does the Arizona bark scorpion growl like a dog? Why does the cactus wren use cactus plants for its nests? What is the purpose of those huge ears on the fennec fox? Does the Texas banded gecko live only in Texas? Does a kangaroo rat have a tummy pouch? Learn the answer to these questions and many more in this fascinating 15-minute book about desert animals. 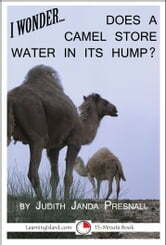 With a fun question, each page introduces a new desert animal and tells some fun information about it. I Wonder...Does a Hammerhead Shark Pound Nails?